If you garden in a warm climate, you may want to consider growing a lemon tree. Even if you live in a cool climate, there are several dwarf varieties available that grow well indoors. The fruits are a phenomenal source of vitamin C and can used in a variety of ways in the kitchen. If you don't care much for lemons, the trees alone are beautiful enough to justify the effort. 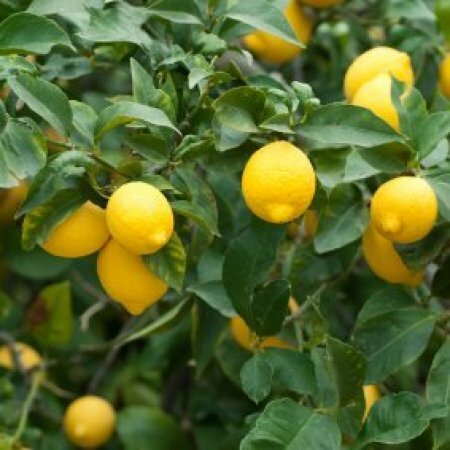 Lemon trees are generally hardy to the warmer parts of the country (to zone 7), and each growing zone has specific varieties best suited to the local growing conditions. Before selecting a variety, contact a local nursery or your state's Cooperative Extension Agency to get advice from experts on which varieties grow best for where you live. Agricultural commerce among various "citrus regions" is strictly regulated in order to avoid transmission of disease. This means you will generally buy your plants locally anyway, unless you are planning to grow them indoors. All citrus trees, including lemons, like plenty of sun and heat, so if you live in the cooler edge of a variety's hardiness range, make sure to plant it in the sunniest, warmest, most protected part of the yard possible. If your area is very hot, some relief from the sun will be appreciate, especially at during the afternoon. If drying winds are a problem, consider protecting your tree with a windbreak. Like other citrus trees, lemon trees prefer a soil pH that is lightly acidic-between 5.5 and 6.2. Many parts of the country feature alkaline soil, so unless you're growing trees indoors, it's wise to start with a soil test so you can make any necessary corrections well ahead of planting. Lemon trees can tolerate heavier soils, as long as they are well drained. They need ample amounts of moisture for growth, but they won't tolerate standing in water. Because they bloom and produce all year round, lemon trees can be planted at any time of the year. Because the trees are almost always grafted, it's usually necessary to plant them a bit higher than they were growing in the nursery-ideally so that the graft union (usually seen as a diagonal scar near the base of the trunk) is between 4 to 8 inches above soil level. Water new trees thoroughly and keep a careful eye on moisture levels throughout the tree's first season. Wash the seeds immediately with plain tap water-don't let them dry out! Place them 1/2 in. deep in a peat pot filled with damp, sterile potting soil and cover the pot with plastic to keep it moist. Place the pot in a sunny window until it germinates (a couple of weeks). Remove the plastic from the pot, and continue to keep the seedlings moist, and in a warm, sunny location. When the seedlings reach two inches tall, thin to the strongest seedling by snipping the others off at soil level using a scissors. When the remaining seedling starts to outgrow its pot, transplant it to a pot twice the original size and continue to treat it like a houseplant. Be patient. Lemon trees grown from seed have a long juvenile period. Plan to wait 8 years or more before you start to see any fruits! Watering: Lemon trees planted in the ground have shallow roots that extend well beyond the drip line. Although they need ample moisture to maintain growth, it's okay to let the top 4 to 6 inches of soil to dry out a bit between watering. Too much water can be just bad as too little. Constantly saturated soil may stunt growth, encourage disease and affect the taste quality of the fruits. Feeding: Citrus trees need a good supply of nitrogen. Trees growing in lighter soils will benefit from a top-dressing of compost and well-rotted manure several times a year. Container plants should be fed a liquid organic fertilizer that is higher in nitrogen than phosphorus or potassium (3-1-1, or 2-1-1). Apply according to label directions. Weeding: Keep the area around the base of your lemon tree free of weeds. The roots of the trees are shallow and may not compete well with other plants-even grass. Use mulch to suppress weeds and conserve moisture, just keep the area within 6 inches of the trunk mulch-free. If gophers or rodents are a problem in your area, avoid using mulch as it gives them a good place to hide. Pruning: Your lemon trees will not need much pruning. In fact, a good scaffold of branches and ample foliage will protect the fruit and lead to greater yields. As lemon trees mature they may need some light pruning to keep their form round and compact. Always remove any dead, damaged, or diseased wood as soon as you notice it. Container-grown trees may need to be root-pruned every few years to control growth. Aphids, mealy bugs, and red spider mites can all attack lemon trees. They can be controlled to some extent by spraying with a strong stream of water or by using an organic, insecticidal soap. Fungal disease problems are much more prevalent in humid areas than they are in drier regions. Good cultural practices are the best way to prevent these diseases. Start with disease resistant root stock planted in quality soil with good drainage. Keep your landscape clean by destroying all plant debris and cutting off suckers as they emerge from the roots. Lemons can be harvested year round, but like all citrus trees, they must be fully ripe on the tree before you pick them. It is sometimes hard to tell if lemons are ripe, but they should look bright yellow and smell lemony. If you have to work too hard to remove a lemon from the tree, it's probably not ripe yet. Lemons will keep quite a long time hanging in the tree, so there's no urgent need to pick them until you're ready to use them. Lemon trees make fine container plants, especially in cooler climates. Grow them as small trees in containers on your patio in the summer, and move them to a sunny spot indoors to spend the winter. Their growing needs are the same as lemon trees grown in the ground-plenty of sun, the proper amount of moisture, and good drainage. Plants growing in pots should be put on a fertilizing schedule to ensure that they get consistent nutrients. Containers should be as deep and wide as you have room for (bigger is better), and should be placed on castors to make moving heavy pots outdoors as easy as possible. In spring, move them into partial shade first before exposing them to bright outdoor sun. In fall, do the reverse. Give them a bit of shade before moving them back inside to minimize the shock. Indoor air can be dry in the winter, so keep plants on a pebble tray or mist them regularly to maintain some humidity. Lemon trees grown in containers are much more susceptible to cold and drought, so keep an eye on temperatures and moisture. Because these trees are almost always grafted, the main root stock may eventually send up suckers to try to overtake the tree. If you see suckers coming up from the base of the trunk, remove them with a clean pruning shears as soon as possible. Popular indoor varieties include, Meyer Improved Dwarf, Lisbon, and Ponderosa Dwarf. I am planning on planting a Lemon Tree this spring - good to know that they produce year around. I tried Grapefruit and am just now picking them and they are wonderful. Hoping Lemons will be good also. This might sound weird, but has anyone ever taken whole lemons and stuck them in the ground? I heard it works but I've only just now tried it. Anyone know if it'll work? If not I'll keep you posted! I suppose it might work, as long as the lemons have viable seeds. I grew a lemon tree from a seed I found in a grocery store lemon once. It looked really fat and had some purplish colors so I stuck it in one of my houseplants. I kept that tree in a pot for years, before it finally died. I live in the Pacific NW so I would only take it out during the warm months. I would get organic lemons or even ones from the local farmer's market, if possible. That way you know they are the type of lemons that grow in your area.